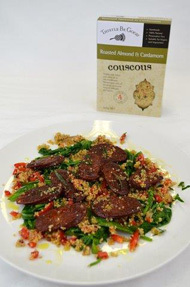 Serve with slow cooked lamb shanks and oven roasted vegetables – wonderful when the couscous soaks up the sauce – yum! BBQ lamb fillet, cut into medallions and mix through couscous. Drizzle with olive oil and lemon juice. Serve with rocket and mixed green salad. Cook bacon until crispy then crumble over top of couscous, along with chopped ripe tomato and dollop of sour cream with torn, fresh basil. Serve with pitta or yiros bread. Slice chorizo, red onion and red capsicum. Chop ripe tomato and mix everthing through the couscous. Drizzle with your favourite infused olive oil (mine is lemon) and serve with a big salad. Finely dice cucumber and tomato and mix through couscous for an easy lunch. Grate carrot, red capsicum, zucchini and add to couscous along with a cup of cooked chick peas. Make dressing of natural yoghurt, half garlic clove, dozen chopped mint leaves and salt and drizzle over the top. Serve with pitta or yiros bread. Simply pan fry chicken breast strips in olive oil and lemon juice until browned, then place on top of couscous and serve with mixed salad. Crumble 100gm fetta, handful of toasted pistachios or pine nuts and handful of basil leaves. Spoon greek yogurt on top and serve with green salad and/or pitta or yiros bread. Crumb fish fillets or prawns with Thistle Be Good Egyptian dukkah and serve with couscous. Make dressing of natural yoghurt, half garlic clove, dozen chopped mint leaves and salt and drizzle over the top – you’ll think you’re in a fancy restaurant.